After two decades of appearing on our screens, there are a number of assumptions we, the audience, take into an Alan Partridge film. A suspect taste in music, an inability to successfully navigate social situations and any number of conversational faux pas are par for the course. 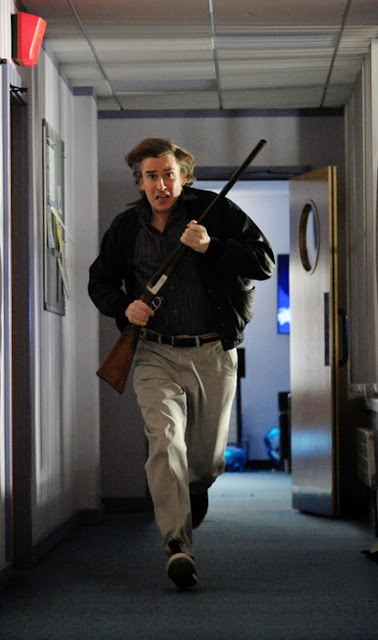 Yet, as to be expected from Steve Coogan and the incredibly talented group of writers he has collaborated with, there are more pleasant surprises than a stick can be waved at in Alan Partridge: Alpha Papa, his long awaited big screen debut. For many, the definitive image of Partridge is one of sheer desperation and a kind of quiet loneliness – the imagery of him driving to Dundee, barefoot and eating suspect flavoured Toblerones, in the midst of an agonisingly pro-longed breakdown, is one that sums him up. Until now, Partridge has been consumed by a bitterness and sadness that life hasn’t exactly gone the way he planned – a failed marriage and TV career behind him ate away his insides. Yet, rather pleasingly, the Partridge we meet in Alpha Papa is an entirely different beast – sure, his new career downgrading to North Norfolk Digital may be a million miles away from his prime time BBC chat show but, perhaps for the first time in life, Partridge seems quietly content with his lot. That is, at least, until his career is threatened by a new multimedia conglomerate named Shape who aim to re-brand North Norfolk Digial as a character-free, "youth friendly", nightmarish dirge of a broadcast platform. In desperation to save his job, Partridge suggests the station simply fire fellow DJ Pat Farrell (Colm Meany) instead. It's a decision which is not without ramifications - the seemingly genial Irishman loses control and takes the station hostage along with its resident DJs, Shape middle men and a familiar Geordie security guard. Pat refuses to negotiate with anybody except Partridge - for the first time in his career, the East Anglia-based DJ, whilst perhaps not offered anything as lofty as the chance to become an all-conquering hero, is given something close to a shot at redemption. 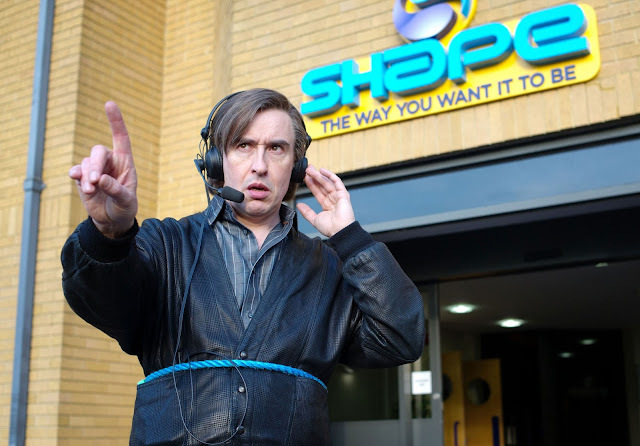 Coogan excels in the role of his most iconic character and kudos must be given for the way the character has organically aged throughout the years - initially an old man in a young man's body, Partridge is now knocking on a bit but his age-inappropriate embrace of hands free ear pieces and "youth" speak show a man struggling to fit in the modern world despite his best efforts. It's this clash which, like the rather delightful The World's End, allows for us to step into the shoes of a protagonist who actively rails against the corporate homogenization and sterilisation of contemporary culture he doesn't understand - much like Simon Pegg's odious Gary King, our hero is a rather unlikely one. Partridge's ways may render him something of a dinosaur on air (asking questions such as: "which is the worst monger: fish, iron, rumour or war?”) but surely even this is preferable to the rampant insincerity and blind conformity of ubiquitous youth branding represented by Shape? Adding doses of slapstick to his general nonsensical patter, Coogan's Partridge is a comedy force of nature but one who sadly stands up to better scrutiny over the course of a 30 minute television show than for the length of a feature film. Whilst the idea to bring back Lyn (Felicity Montagu) and Michael (Simon Greenall) in supporting roles is a wise move, the characters feel underdeveloped and under-utilised - if either of the characters were exorcised from the script, their contributions would not be missed. Perhaps the main problem of the film, however, is one of scale. Partridge has always been a character of in-action rather than action and most of the humour in the show comes from the humdrum inadequacies of his life - an internationally significant event doesn't fit well into the character's mythology and the scope of the events that unfurl before us bury the supporting cast as irrelevant too. That's not to say the movie is a total mis-fire. Sidekick Simon (Tim Key) raises laughter numerous times with his deadpan delivery and Colm Meany, despite being a lunatic with a gun, brings a real sadness and gravitas to his role which means it's impossible not to root for him against the oleaginous Shape. Yet, sadly, like Partridge's own broadcast career, Alpha Papa is a movie which never quite reaches the heights it should have leaving a feeling of "what could have been". The film, like the outcome for Partridge at it's conclusion, represents only a modest triumph. Great review Kieron - loved the film and watching all the old ones on Gold!